Helps maintain a constant vehicle speed and a set following distance behind a vehicle detected ahead of yours and, if the detected vehicle comes to a stop, decelerates and stops your vehicle, without you having to keep your foot on the brake or the accelerator. Improper use of ACC with LSF can lead to a crash. 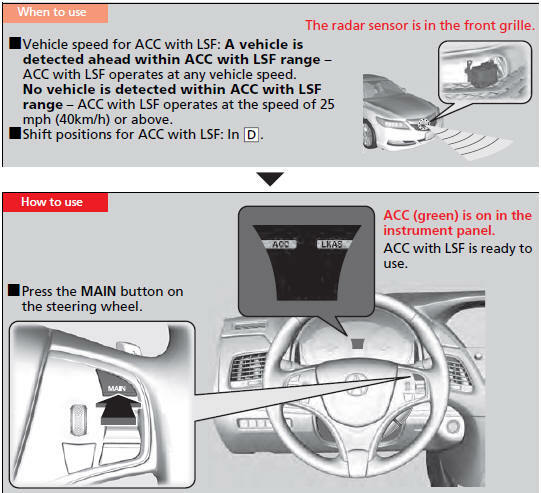 Exiting a vehicle that has been stopped while the ACC with LSF system is operating can result in the vehicle moving without operator control. Inappropriate use of ACC with LSF can result in a serious accident. Use the brake pedal whenever necessary, and always keep a safe distance between your vehicle and other vehicles.